1) It would mean going to my mother and talking about personal hygiene. I fully support going to your mother any time to ask any question you have about your body; my mother is my wealth of knowledge. But, at that time, I did not see that as a viable option. 2) For the attention. As I was then, I am now. I like attention and well, that was a way to get it easily. 3) Why should I? Why should I, a then 12 year old girl, put blades anywhere near my body? Where was the sense in that? I did eventually talk to my mom and she got me a razor. I now had smooth legs and underarms. It was all good for a few days. My friends all gasped and exclaimed over my sudden silky skin and I basked in the spotlight once more. It was after the few days that the problem started, the problem that has persisted and will continue to haunt my life and all the lives of women who wield the mighty and dread razor. 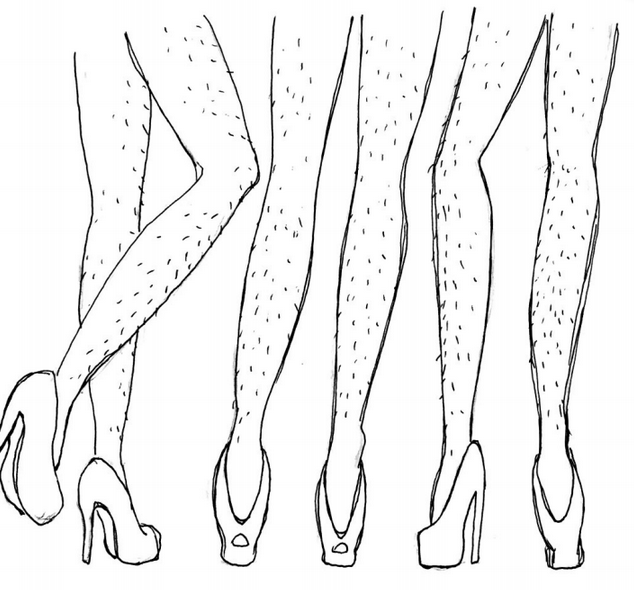 These two qualities will endure in the lives of women as long as shaving is a social stigma for females to adhere to. Stubble is gross, a nuisance, and a reminder you must shave again. Again, after shaving a week before, 3 days before, or ONE day before, depending on color and speed of hair growth. An ugly reminder that you must once again pick up the razor. Thus, pressure commences to bear down upon you like that teacher you know that has been waiting all day to give out a class-length quiz you know you are not prepared for. Pressure is the noose that tightens around a girl’s neck and is what whispers in your ear that yes, that girl over their was looking at your legs and no, keep your arms down! Do not wave them in wild and glorious abandon and disgrace yourself by displaying the skin beneath your shoulders! For shame! One night in the days of bitter winter, I made the decision to shave my legs. The legs that had not been shave for more than a month and I was looking more like Tarzan than Jane. So I went about my shaving ritual and was rubbing on lotion before I knew it. However, I forgot a part of the ritual. You see, I used to rinse my razor in the tub that I filled with water (I have since upgraded my practices). So my brother the next morning went to shower. He looked down at our shared tub and yelled for my mother: “Mom! The cats have shed in the bathtub!” My mother was perplexed; she knew that our cats don’t shed in the bathtub… She went to see what my brother was hollering about and started to laugh at his blunder. “That’s not cat hair,” my mother said to my brother. “Emma didn’t rinse the tub after she shaved her legs.” I DIDN’T RINSE MY TUB! IT WAS COVERED WITH MY LEG HAIR! My mom told me that my brother was disgusted by this revelation and that he could not believe I had so much hair on my legs. I shake my head at him. Oh little brother, naïve little brother. How little you know. My thoughts on shaving are this: it is an evil, but a necessary evil (to some; to those who No Shave November year round, more power to you!). Shaving should be an act that you do because you think it is time to shorten the length of hair and not because you get self conscious in your shorts. You are the Mistress of the razor, the Razor is not your mistress! Grrl Punch is the genius invention of Lucy Hargrove and the place where I have been given the opportunity to express my thoughts and feelings on topics that are important to me and other girls. This amazing concept has gifted me and 14 other girls the freedom to express who we are. We have the chance to do so with a sense of pride and be gratified by what we write. Our very essence seeps into each word that we share with others and I am proud of what me and my peers are presenting to the world: strong, intelligent, and independent women who are not afraid to convey their opinions to anyone and everyone.